The Motorola Droid is the new King of the Hill over at Verizon Wireless. You want to do battle with other Android handsets? The Droid X is the phone to pick. It boasts top specs and top performance in a hardware design that is probably the best to come out of Motorola's engineering labs. The Droid X is big, beautiful, and bound to steal some hearts. 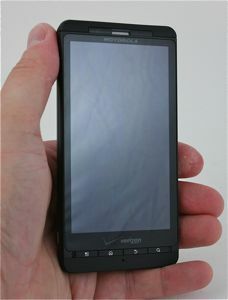 would you recommend the Droid X over the HTC Incredible? External Antenna on Droid X? I need an external antenna since I frequently travel in low signal areas. I know that the Droid (without X) has an antenna connector on the back under the battery cover (under a small plastic plug). Does the Droid X have this connector? Do you know what size/type connector it is? Do you know where I can buy an "antenna adapter cable" for this connector (if there is one)? Does anyone know if the Droid Xs Video output capabilities will include being able to watch Blockbuster rented movies on an external screen ? I asked a Motorola Rep about it the other day, and they were not sure about the answer. is droid x's browser faster than the evo 4g or nexus one with 2.2? the evo, yes (from the review here), the n1 with 2.2 maybe not. Remember, the n1 has the new browser with better scripting. Unfortunately I don't have an evo4g or nexus 1 to test it against. Seems Motorola has learned from the past. It's win! What's the 3D performance like? How well do 3D games run on the Droid X? Does it have a dedicated GPU like the original Droid/Milestone? Yes, it has a dedicated GPU, and from the benchmarks sites like androidcentral are showing, it's a 3d beast.